Finding a name for a project seems difficult. Especially one for a worldwide audience. With so many of the terms already used/registered as trademarks. And should the name be build from terms semantically connected to the topic of the project or made up out of the blue? 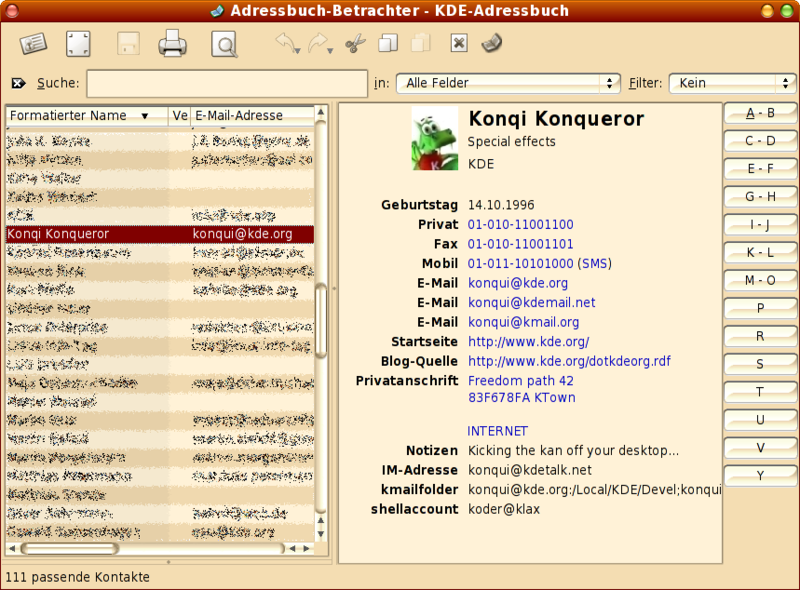 The nice people on the mailinglist kde-promo tried to help, but we could not find one that was really kicking IMHO. Well, after all there are companies specialised in this (see for the creation of the name Kodak or all the car names). ხალხი (say [χalχi]) it is. The Georgian term for people, as in group of persons. As the english language is the KDE lingua franca, the referencing name may be one of the transciptions, that is Khalkhi. Having chosen the name, the experimental kdepim branch for KDE 3.5 now got the commit of the former Contacts framework from trunk/playground/pim as the new libkhalkhi. KAddressbook already got a first patch to make use of Khalkhi, so the time of hard coded property types and services on them might come to an end some time. Looks pretty cool. Especially the additional data (unread mails, not registered IM system) are very useful. Would be nice to have a link to a vitual folder showing only the (unread?) mails of that account or mail-address. Yey! Integration with Kaddressbook! Now we are going places!